Ronald R. Ruff, 81, of Point Place passed away Sunday, October 14, 2018 at Hospice of Northwest Ohio. He was born September 1, 1937 to Ralph R. Ruff and Mable (Ruff) Brown. He married his wife, Jane, of 56 years in November 1961, together they raised three children. 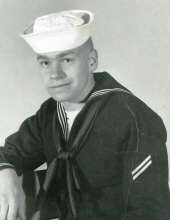 Ronald graduated from Macomber High School in 1955, and then served in the U.S. Navy from 1956 to 1960. He then attended Owens Community College. He worked for DeVilbiss for 21 years and then retired from New Mather Metals in 2001. He was a baseball coach for Shoreland School, and was a member of the American Legion Post #110 and the V.F.W. Post #10178. Ronald spent his winters in Florida. He enjoyed golfing, fishing in Canada, and playing cards, especially Euchre, but most of all he enjoyed his family time. In addition to Ronald’s parents, he was preceded in death by his son, Rory; sister, Ruth; and step-father, Frank Brown. He is survived by his wife, Jane; daughters, Roxanne (Joseph) Maier and Renae (Craig) Statler; grandchildren, Raelyn, Randon, and Erica; and brother, Ralph. A memorial service will be held on October 20, 2018 at 11AM at Mesiah Lutheran Church, 4703 N. Summit St; friends and family will be welcomed beginning at 10AM. In lieu of flowers, please consider giving to Mesiah Lutheran Church. To plant a tree in memory of Ronald R. Ruff, please visit our Tribute Store. "Email Address" would like to share the life celebration of Ronald R. Ruff. Click on the "link" to go to share a favorite memory or leave a condolence message for the family.